One of our roles is to put sponsors and charities together. We would love to be able to tell the charities and organizations that contact us about getting Wells that a sponsor will provide a Well for them. This provides a great opportunity for corporations and foundations. 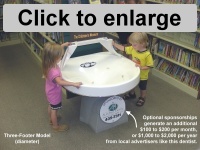 Sponsors get their “Provided by,” or “Sponsored by,” sign and message on the Wells…PERMANENTLY! Unlike radio, television, newspapers, roadside billboards, and other advertising that vaporizes in the air or gets only one impression, sponsoring Wells will provide exposure for you INSIDE the most valuable real estate in any city…retail spaces or locations with large volumes of people. 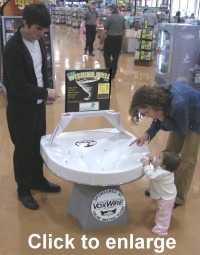 Children, young parents, and grandparents will stand at a Well for several minutes at a time, smiling, laughing, having fun, and looking at your logo, message, website, and phone number. And they stop at the Well over and over as they shop in that location through the years. 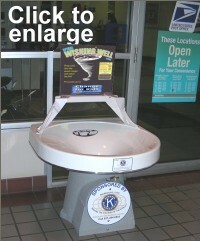 Spiral Wishing Wells will bring you publicity and advertising exposure year after year. Many Wells have been in continuous operation since 1985, the year we invented and filed our first patent. So your one-time sponsorship cost can provide benefits to you for decades. The cost-per-impression is extraordinary. And it is in the context of community support for optimum public relations. 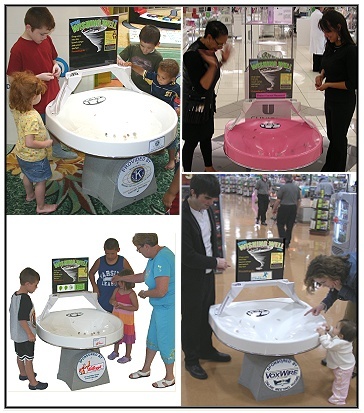 "There is no better advertising opportunity for a business than having its name on Spiral Wishing Wells located in the most valuable real estate in town...."
Specific Types of stores: Department stores like Wal-Mart, grocery stores, drug stores, etc. Schools: Schools are in desperate need of funding, and many of them contact us about getting Wells for their lobbies, athletic events, and to place in their communities. Science teachers also use them for physics lessons. If you haven’t already seen the Student Guide, be sure to take a look. It is all about the physics of the funnel, tornados, whirlpools, and planetary orbits. Churches: We receive inquiries from a lot of churches that want to raise money for their children’s programs, community projects, and missions. This would provide extraordinary public relations for a sponsor. 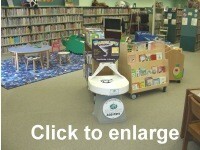 Libraries: Libraries are no longer the “shhhhh” quiet settings they used to be. Many of them now have interactive areas, and Spiral Wishing Wells fit right in, especially with their educational features. YMCA’s: The modern YMCA has lots of members and visitors accessing their exercise facilities, classes, summer camps, and day care. They would love to have a sponsor provide Wells for their facilities. Humane Societies and Animal Shelters: Pets are growing in popularity, and facilities for animals are struggling to keep up with the pet education, rescue work, and other services that this growing sector needs. Service Clubs like Kiwanis, Rotary, Lions, Jaycees, Optimists, Elks, etc. Fire Fighters: All local fire departments need to raise funds and awareness of their services and fire-prevention programs. 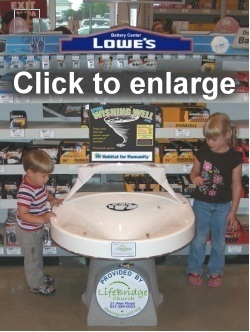 They place Wells in local stores and restaurants which provides great exposure for sponsors. Public Locations: The following category of locations have their own floor space. 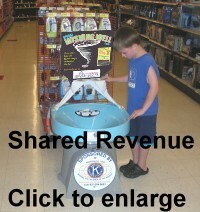 Spiral Wishing Wells have provided millions of dollars for their funding. Many of them would like to upgrade to the new models and the larger Seven-Footer. These would be great locations for a national sponsor. Click here to read about Wells in this public category. We have template press releases that you can use to kick off your campaign, and to report various levels of income over time. With large programs, millions of dollar's worth of coins will be raise, and this makes VERY good press. 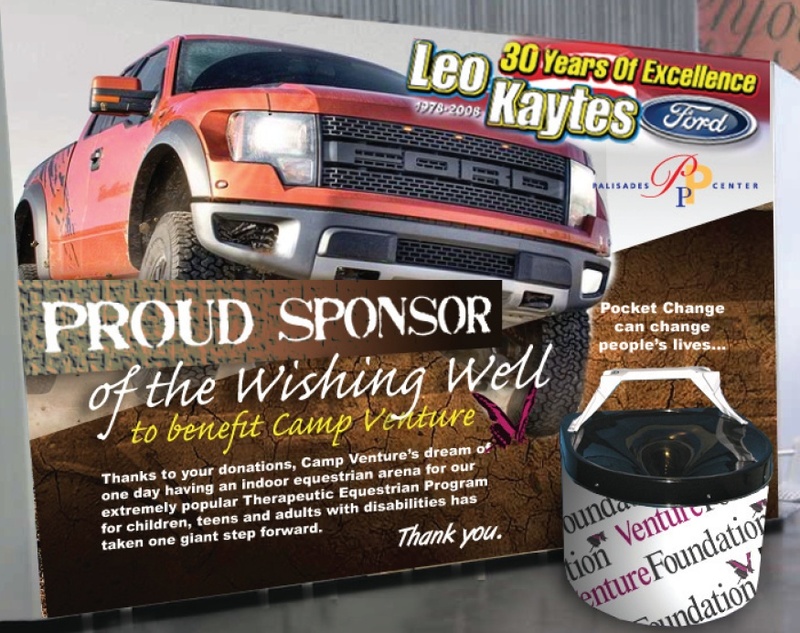 We also have templates for the local charity to promote the sponsorship in their local media. Who gets the money that is raised? In a typical sponsorship program, 100% of the coin revenue goes to the charity, and the sponsoring organization receives the public relations and marketing benefits described on this page. You do. Unless you want to donate them to the charity. It is completely up to you. But if you own them, you have an additional level of control. How much do the Wells cost? When 100% of the coin revenue goes to a charity, the sponsor only has to pay a portion of the cost. ProjectKindness.org has put up a large Grant that will cover some of it, and they do it anonymously. In other words, they do not put their name on the Wells...you get the full sponsorship credit for a portion of the cost. Please contact us (see below) to discuss the portion of the cost that needs to be covered by you as the sponsor. Generally, the sponsor covers the portion of the Well not paid by Project Kindness, and the charity does all the work. They place the Well, collect the money, keep the Well clean, and maintain your sponsorship sign. 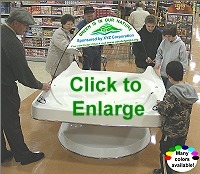 If you want to change the sign to promote or introduce another product or program, they will do that for you. If you become a sponsor, you can develop a relationship with a charity directly and just tell us where to ship the Wells. If you select a category such as schools, we can work with you to develop the parameters so that when we receive inquiries from schools, we can forward the details to them. You can set it up so you have a lot of involvement in the process, or as little as you wish. In all cases, sponsors are in charge. We can make custom colors for you, custom signs, and can include any materials you want included in your Wells. In other words, a sponsorship program is a turn-key program where every detail is simple and thorough. If you want to cover your entire city, you can "brand" the whole market with your Wells. Everywhere that people see them, they will think of you and know that you are involved in promoting good will in your community. If you want to cover a category for the entire nation, the PR benefits are unlimted. Click here to see an example program for a real estate company. 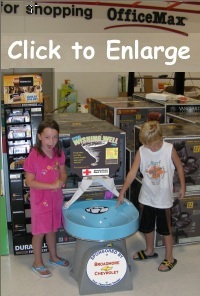 Click here to see more ideas and "kit tools" for loaning Wells for local events. Whether you are a national or regional corporation interested in sponsoring hundreds or thousands of Wells for a well-known charity or type of category, a family foundation looking for a way to make your donation go much father than an interest-bearing endowment donation, or a local company wanting to expand your exposure with the sponsorship of a single Well, please call me personally by phone or contact me by email to discuss a program that will fit your needs.